Aluminum 36" x 48" Loading dock plate with a 9" lip-bend and machine beveled edges provides a smooth transition from a dock surface to tractor trailer bed for material handling with pallet jack trucks and hand carts. Bridge the gap between trailers and loading docks easily and conveniently. Each dock plate is rated for a maximum 3,500 lb capacity over 3" surface height at 14% grade or 5" at 19% grade. Made from heavy duty 0.375" thick aluminum plate construction with a diamond tread surface. Includes bolt-on steel lock legs to help reduce plate shifting between trailer and dock during use. Weighs 72 lbs and includes carrying handles for moving the dock plate to and from loading areas. Designed for use with non-motored equipment, pallet trucks, pallet jacks, foot traffic, and hand carts only. 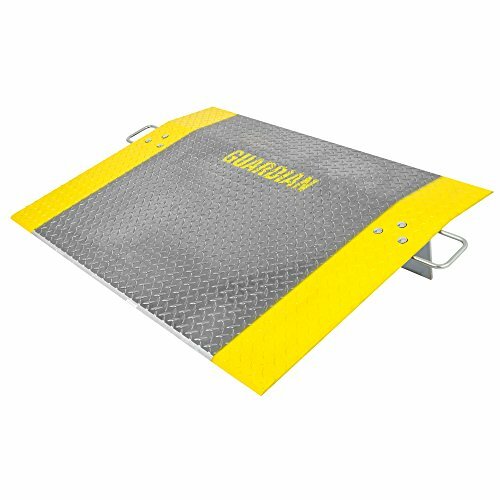 Diamond Plate Loading Dock Board 48" x 60"